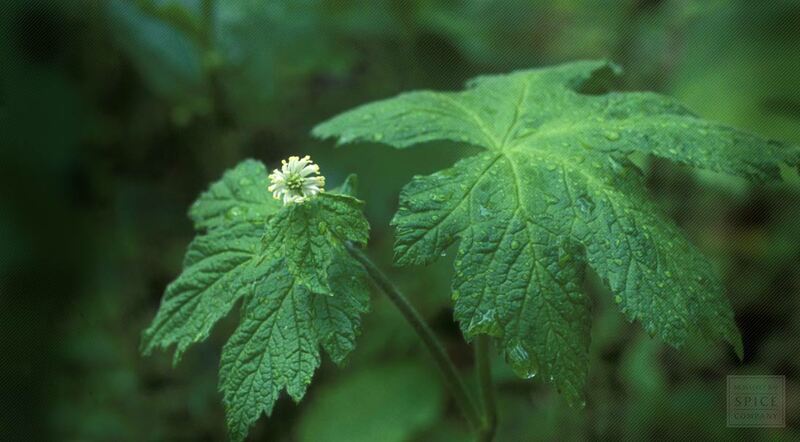 Also known as Eye Balm, Jaundice Root and Ground Raspberry, goldenseal is a member of the buttercup family that is native to eastern North America. 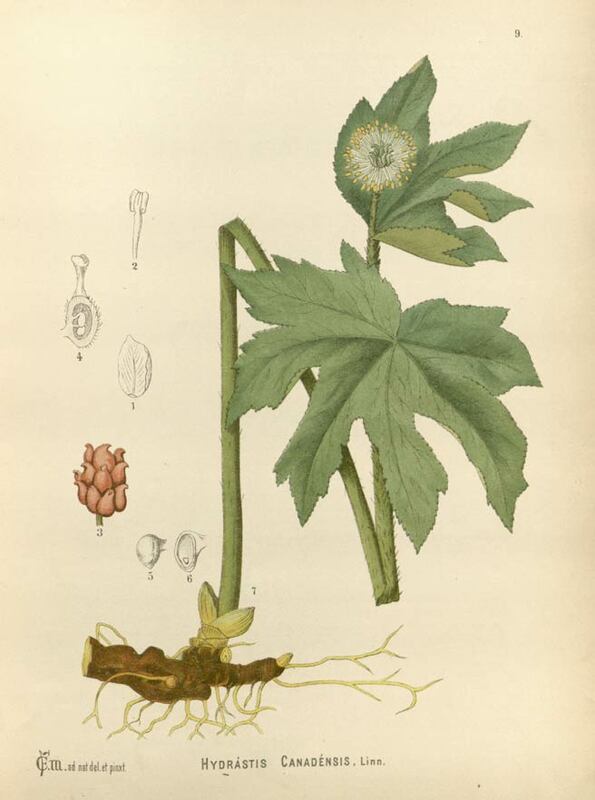 The golden-colored rhizome of the plant is a natural source of berberine and hydrastine, which are responsible for the bitter qualities of the herb as well as the yellow dye that can be extracted from the root. Goldenseal leaf is also harvested, which is primarily used to make teas and topical preparations. Both goldenseal leaf and root are taken in capsule form, or are used to make tinctures and extracts. Goldenseal is a small perennial herb of the Ranunculaceae family. The plant's bright yellow root-stock is horizontal, irregularly knotted, and grows from from 1/4 inch to 3/4 inch thick. It is marked with the previous years' flower-stem scars. Below it has slender roots. In the early spring the hairy, flowering stem pushes up and grows up to 6 to 12 inches in height. The stem is cylindrical and erect, with downward-pointing hairs and is surrounded at its base with a few short, brown scales. The plant produces two wrinkled and prominently-veined, dark green leaves that are also hairy. These are formed high up on the stem. The lower one is stalked; the upper stalkless, and roundish in outline though is palmately cut into 5 to 7 lobes, with its margins irregularly and finely toothed. Additionally one solitary, large, radical leaf will grow on a long foot-stalk—its form similar to a larger version of the stem leaves—though when full-grown it will reach about 9 inches across. In April, the plant's small, solitary flower is produced. It is terminal, erect, and has three small greenish-white sepals, which fall away immediately after expansion. There no petals but there are numerous stamens. Goldenseal fruit is a head of small, oblong, fleshy, red berries that ripens in July. They are tipped with the persistent styles and contain one or two hard black, shiny seeds. Though it resembles a raspberry it is not edible. The common name Ground Raspberry refers to the fact that goldenseal fruit resembles an inedible raspberry. Grows in shady woods and moist places at the edge of wooded lands. Goldenseal prefers rich, moist forest soil. Seeds germinate poorly, so propagation is done by root division throughout the growing season. Plant small pieces of root out into the garden in rich fertile soil. The root is harvested in the autumn after the plant has died down, leaves may also be harvested and dried. Store dried goldenseal root or dried goldenseal leaf pieces or powdered goldenseal in an airtight container in a cool, dry place. Centella asiatica is native to India, Sri Lanka, northern Australia, Indonesia, Iran, Malaysia, Melanesia, Philippines, Papua New Guinea, and other parts of Asia.